The samples color has a white matrix with dark green phenocrysts. 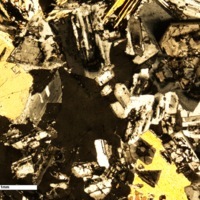 It is phaneritic. There is evidence of chemical weathering due to the presence of a dark brownish orange film on the sample--may be oxidation. There is a sandy smooth feeling film above the TMJ-6 tag. 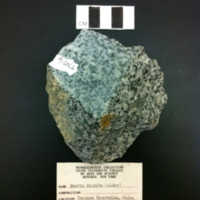 Phenocrysts are medium to coarse grained ranging from 0.1~1cm in length. It has a rough feel overall. 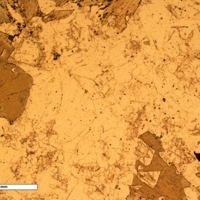 There is tartan twinning on some irregular-shaped plagioclase. It is a large crystal with intergrowths and many micro-tartan twinning crystal within it. Many of the irregular shaped plagioclase have many fractures or scratches in them. There is some amphibole that intergrew into some augite. 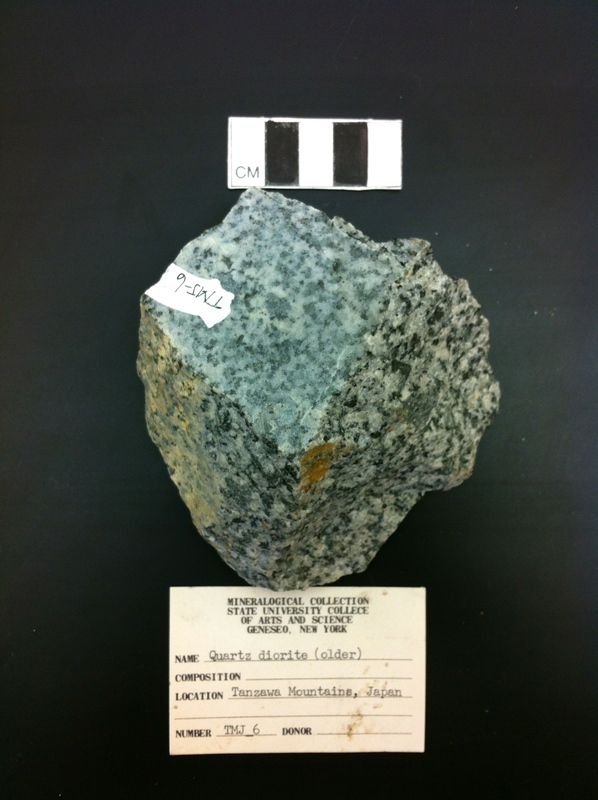 “Quartz Diorite,” Geneseo Geoscience Collections, accessed April 25, 2019, http://www.geosciencecollections.milne-library.org/items/show/342.